you (or your assistant) spend(s) sorting through and prioritizing incoming email messages? I used to spend tons of time setting up filters for my gmail account and my assistant still spent at least an hour a day defending me from email I simply did not need to see. What a waste of our time! Luckily, there is a better, easier, and faster way. 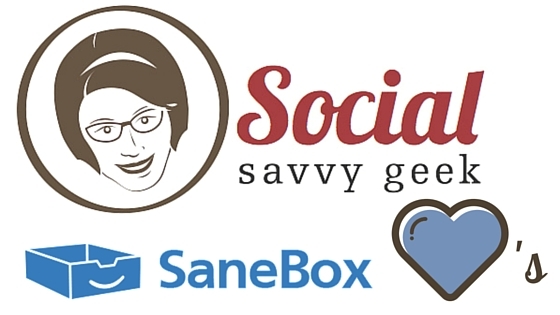 Enter SaneBox and setting up tedious filters is a thing of the past. Woohoo! It’s also quite a bit smarter than the filters and sorting built into gmail. I no longer delegate my email because there is no need. you would be absolutely correct! You may never have cause to speak to them, since their tool works so well, but if you do you’ll be glad you did. They are some of the nicest and most responsive human beings you will ever deal with in the online tool world. No kidding. I don’t get any special compensation for sharing their stuff, but I’m happy to do it for them and for you! (I did once make a very silly video about SaneBox, which they loved and they surprised me with an awesome blue hoodie.) There is a great bring a friend offer, where you get a $5 credit, which is open to everyone with an active account. They even offer a 14 day free trial. So… if you’ve read this far… what are you waiting for?